John Isner was coming out of spin class back home in North Carolina last week when he got the call informing him that he had qualified for the ATP Finals for the first time in his career, following the withdrawal of Rafael Nadal. The 33-year-old new dad flew to the United States after the Paris Masters to enjoy some home comforts like hanging out with his two-month-old daughter Hunter and lying on his couch watching football. He got on a plane soon after, accompanied by his wife and daughter, and came to London to make his debut at the O2 Arena. Isner kicks off his campaign against Novak Djokovic on Monday night (20:00 London time, midnight Dubai time), looking to improve on his 2-8 head-to-head record against the Serbian world No. 1. “I think it will be really easy for me,” Isner said sarcastically when asked about his clash with Djokovic. “I’m up against, for sure he’s the No. 1 player in the world, he’s won this event five times if I’m not mistaken, he’s the player to beat this week for sure. The oldest first-time qualifier since 1972, Isner enjoyed a career-best season this year, winning his maiden Masters 1000 title in Miami, and reaching his first Grand Slam semi-final at Wimbledon. “It means a lot to be here. I’ve certainly been pretty close throughout my career to make it to this event, it just hasn’t quite happened. I also realise that this year I’m pretty fortunate to be here as well. That being said, I had a very good year, and I put myself in the position to make this event, and it happened. For me to do this at 33, to be competing in my first Nitto ATP Finals is very satisfying for me personally,” said the 10th-ranked Isner. The day session on Monday will see 21-year-old German Alexander Zverev take on Croatian four-time qualifier Marin Cilic. Zverev is making his second straight appearance at the O2, and leads the tour with 54 victories posted in 2018, including three titles in Madrid, Washington and Munich. Zverev, in London with his coach of three months Ivan Lendl, will be looking to erase the memories from his third round robin match here last year, where he squandered a lead in the final set against Jack Sock to miss out on a spot in the semi-finals. “I lost the match in a not so good way, so I hope history doesn’t repeat itself. Obviously another year on tour for me, another year of experience, hopefully it’s going to be different this year. But obviously very tough matches, great players, big guys, big serves, and Novak as well, so I’m just looking forward to playing good tennis here,” said Zverev ahead of his opener. For the first time since 2004, four players outside the ‘Big Four’ – Isner, Zverev, Juan Martin del Potro and Karen Khachanov – have won Masters 1000 titles in the same season. For some, it may seem like a sign that we might get a new Grand Slam champion next season, but Isner doesn’t see it that way. “No. I won one, Sascha won two the year before, so he’s not a newcomer in that winners circle. It was Del Potro’s first Masters title but we all know how good he is, he’s got a Grand Slam. Karen last week played incredibly well, and he still had to beat Djokovic in the final, it’s not like he beat someone lower-ranked in the final. He beat the No. 1 player in the world. I still think the old guard with Novak, Rafa, Roger [Federer] and when Andy [Murray] gets back healthy, they won’t be giving up those Masters titles too easily,” said the American. Zverev, who has been described as the future of tennis for some time now but has reached just one Grand Slam quarter-final so far in his young career, admits it’s about time the up-and-comers gave the big guns a run for their money. “For sure we have to step it up, for sure we have to improve, but that’s normal, everybody has to improve,” said Zverev. “Novak this year, what he’s done in the second half of the year is unbelievable. We do see that. We know we have to improve our games, nothing changes. “So someday hopefully we will kind of surpass them and take over, even though it would be great for tennis if Roger and Rafa and Novak play forever, but you’ve got to ask them if they actually want to. Federer is making a record 16th appearance at the ATP Finals this week, where the world No. 3 is targeting the 100th title of his career. At 37, the Swiss continues to defy all odds, which has left Zverev in awe of his longevity. “I don’t know what I’ll be doing when I’m 37. I hope I’ll still be playing tennis, but nobody’s Roger, so… we’ll see how it goes. Obviously it’s a great achievement that in itself, and he’s won this tournament plenty of times, we know his history, he’s won so many other titles. That’s why he’s considered the greatest player of all-time. What’s he’s doing at 37 years old is something we’ve never seen before and I’m not sure, we might not ever see it again, so let’s just appreciate that and enjoy what he’s doing right now,” said Zverev. 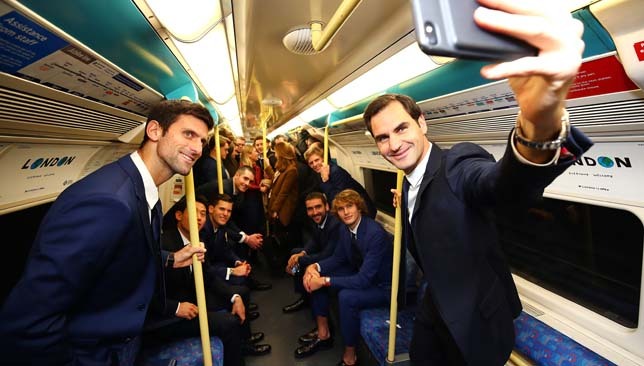 Some lucky daily commuters were dealt a surprise on the London Underground on Friday when they were joined by Roger Federer, Novak Djokovic and the rest of the ATP Finals singles and doubles fields on the tube. All suited and booted for the tournament’s official launch at the Houses of Parliament, the players took the Jubilee line from North Greenwich station to Westminster, avoiding London’s dreaded rush hour traffic. I was invited to the ATP Finals launch party for the first time this year and couldn’t pass up the opportunity to check out the Houses of Parliament and enjoy one last function with the tennis community before the season comes to an end. The Speaker of the House of Commons, John Bercow, is a massive tennis enthusiast and particularly a Federer fanatic. In 2014, he said he watched Federer play 65 times that season alone, and he was of course thrilled to hang out with the Swiss in person on Friday. Let’s just say he did not hide where his allegiances lie one bit at the launch. Andrew Castle was the MC during the event and enjoyed some fun banter while presenting the players. “Did you arrive on the tube as well?” Castle asked Federer. Castle admitted he struggled to come up with questions Federer hadn’t answered a million times before so he took the simple route and asked him how he’s been hitting so far at the O2? “I’m losing every match I’m playing in practice,” confessed Federer. Words the Speaker no doubt did not want to hear from the No. 2 seed just two days before the start of the tournament. Djokovic took the stage with his fellow Group Guga Kuerten members, Marin Cilic (198cm), John Isner (208cm) and Alexander Zverev (198cm). “Do you like playing tall players?” Castle asked the 188cm Djokovic bluntly. “Thanks for bringing that up, because it feels like I’m in a basketball group or something. 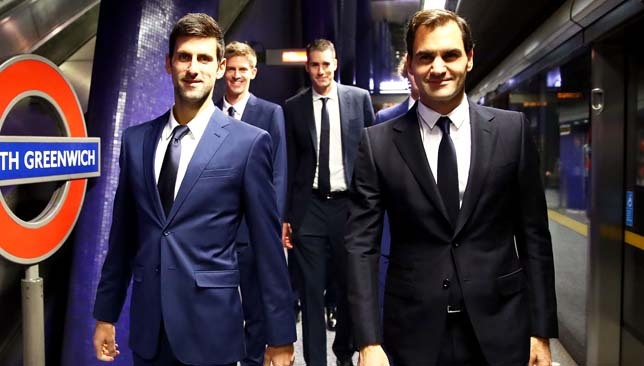 I’m by far the shortest guy,” laughed Djokovic. Lucky for the Serb, his height never stopped him from amassing a combined 25-5 win-loss record against his group rivals. The night was not free of scandal as Zverev turned up for the event sans-socks. Dominic Thiem, who was filming a vlog for the ATP website made sure to call him out on it. Zverev’s explanation: It’s “Zegna-style”. Too bad his sock-less look gave him a blister! He’s been improving his consistency year on year and leads all players on tour by reaching the quarter-finals or better at 14 tournaments in 2018. World No. 8 Dominic Thiem is ready to make his third consecutive appearance at the Nitto ATP Finals, where he opens his campaign on Sunday against familiar foe Kevin Anderson (14:00 London time, 18:00 Dubai time). The 25-year-old, who returns to Abu Dhabi this December for the Mubadala World Tennis Championship, advanced to his maiden Grand Slam final at Roland Garros this season and made a second Masters 1000 final in Madrid. Considered the second-best clay-court player in today’s game, behind Rafael Nadal, Thiem showcased his versatility in 2018, winning his first hard-court title in more than two years by lifting the trophy in St. Petersburg and reaching his first Slam quarter-final on a surface other than clay when he made the last-eight at the US Open. Sport360 caught up with the Gunter Bresnik-coached Austrian ahead of his first match at the O2 Arena in London. You’ve qualified for the ATP Finals for a third straight year, what does that mean to you? It’s a sign of good consistency which makes me proud of course. From the moment I was here the first time I realised it was such an amazing event and from the first time I wanted to come back here. That’s one big goal at the beginning of each season to make it here again and this year I had some troubles in the middle of the year and I only made a last-minute qualification actually, in Paris-Bercy and that’s why I’m super happy to be back. Was it stressful those last few weeks of the season, or were you able to avoid thinking about qualifying for London too much? Of course it’s stressful. It’s easier if I’m 20 in the Race and there’s no chance. I was always on the border somehow and the last tournaments were really stressful. Also thinking a little bit if Del Potro comes here or not and then at the end I made it by myself which makes it very nice. How do you find the round robin format, what do you like the most and least about it? Basically there’s only one thing that is good, but in the same way bad, because even if you lose one match or sometimes even two matches you can still make it and on the other hand if you win one or two matches it doesn’t mean yet that you’re in the next stage. That’s what makes it very different and very special and I think it’s the perfect format for this kind of tournament. What’s the biggest lesson you learned this season? I think it was the French Open final, because I played semis the two previous years but still I was pretty far from making it to the finals and this year in the final it was the first time in my career I came really, really close to my absolute goal which I’ve been hunting since I was a young kid and this was a special feeling and it had quite a big impact on myself and I didn’t realise how much I started to think about it and everything. It was a very good lesson. You’ve had the best hard-court results of your career this season; was the main reason behind that progress on the surface more mental or technical? It was mentally because I already won Acapulco two years ago and also I played well on grass two years ago, so I knew that I could play on other surfaces. Of course last year was exceptionally well on clay that’s why I felt somehow better there than on hard courts. But this year was really good on all surfaces except grass. And the end of the year was great with the title in St. Petersburg and I made my first ever semi-final on a different surface than clay at a Masters 1000, there was definitely progress. What was the best moment of the season for you and what was the worst moment? The best moment was I think still when I converted the match point against Cecchinato in the French Open to make my first Grand Slam final. And the worst one is when I lost the match in Kitzbuhel. You played a great five-set match against Rafael Nadal in the US Open quarters, which you lost in a fifth-set tiebreak. Did it take you long to get over that defeat? It was a very tough loss but it didn’t take me I think five minutes to get over it because I realised straightaway how great that match was, how amazing we both played for almost five hours and I straightaway realised that it was a great boost for the rest of the year or maybe for all my career so it didn’t take me very long to get over it. This year, four of the nine Masters 1000 tournaments were won by non-Big Four players (Del Potro, Isner, Zverev, Khachanov). Do you think it’s a sign that we’ll see new faces as Grand Slam champions next season? Yes, the change has to happen at some point and I think next year, or at the latest in two years we will see a different Slam winner again I think. Was there a point in your career that gave you the confidence or convinced you that you belong among the world’s top players? Actually it happened when I qualified last year for the second time here because the first time I was super happy to make it but at the same time I was never expecting to make it a second time because you have to play that well and consistently all over the year but when I made it for the second year in a row then I realised and I knew that I belong here and that’s how I felt. Since you’ve been dating WTA player Kristina Mladenovic, you’ve probably got to watch a lot of her matches and have a better understanding of the women’s tour than before. Has that given you any new perspective on the importance of the WTA for tennis as a sport in general? The only thing I can say is that I saw how hard she works, she’s working as hard as me and all her life is about tennis and about getting better and about practicing, same like me. I guess it’s the same with all the women’s. I think they all deserve to have a great tour as well. If you’ve seen much of the Next Gen Finals, are there any rules from it that you’d like to see on the ATP tour? First of all I really like to watch the Next Gen Finals. I think the let rule is pretty interesting and funny. To be very honest I don’t think there is a real need for linesmen. I think it worked great at the Next Gen Finals and there are probably way less mistakes than it is with the linesmen and it doesn’t look bad either. But I think we shouldn’t change everything but to make a test in some tournaments, why not?